*FOR OTHER MUSEUMS SEE "MUSEUMS - HONG KONG ISLAND" AND "MUSEUMS - NEW TERRITORIES"
Amongst may impressive exhibits are a 42m long beach with life-like Neolithic inhabitants engaged in various activities, reconstruction of Hakka peasant family’s house, festive activities of the annual Cheung Chau Bun Festival including bun towers, temporary Cantonese Opera theatre and Taoist altar, an old street scene from the early 20th century with shops and double-decker tram and a port scene with steam launch. 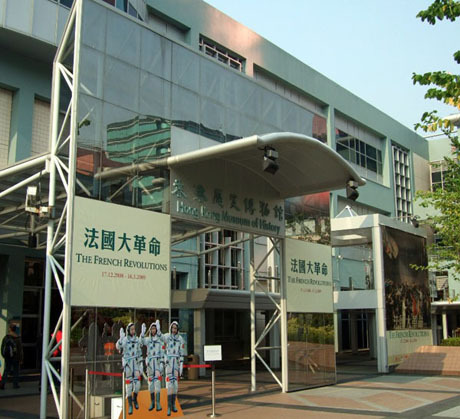 * The Hong Kong Story permanent exhibition is to undergo a major renovation owing to expanding museum collections and new display techniques and a public consultation for opinions on the renovation was held in March and April 2016. The exhibition is expected close between 2020 and 2022. The revamped exhibition will comprise two major displays, on ancient Hong Kong through to the 21st century and Hong Kong through different themes. The museum also has a large Special Exhibition Gallery where temporary exhibitions are held, theatre, refreshment corner and shop. An audio guide service is available in four languages. 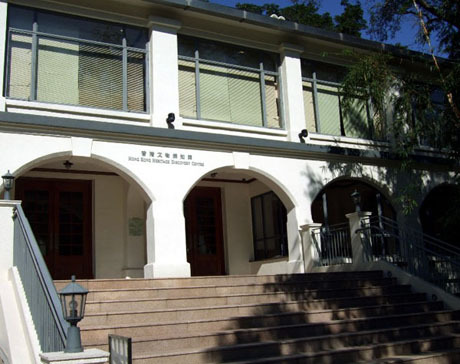 The museum has five branch museums: Hong Kong Museum of Coastal Defence, Lei Cheng Uk Han Tomb Museum, Law Uk Folk Museum, Fireboat Alexander Grantham Exhibition Gallery and Dr Sun Yat-sen Museum. The annual attendance of the museum for the fiscal year ended 31st March 2017 was 1,038,000. GETTING THERE – MTR to Tsim Sha Tsui exit B2 then walk along Cameron Road to Chatham Road South. There is an elevated pedestrian footbridge link to the museum (about 15 mins). MTR to East Tsim Sha Tsui exit P2 then follow Chatham Road South (about 10 minutes). MTR to Hung Hom exit D1 and follow elevated covered pedestrian link under Cheong Wan Road to Science Museum Road, Granville Road and Chatham Road South (about 15 mins). Buses 5, 5C, 8, 8A, 26, 35A, 41A, 81C, 87D, 98D, 110, 203, 208, 13X, 215X, 219X, 224X, 260B, 260X and A12 pass the museum. East Tsim Sha Tsui Bus Terminus on Science Museum Road is five minutes walk from the museum and served by buses 26, 35A, 41A, 98D, 208, 13X and 973. Also all Cross-Harbour buses stop at toll plaza at Hung Hom then follow pedestrian footbridge link. NOTE – the Museum of History is located next to the Science Museum although the two museums have postal addresses in different streets. Since its opening in 1991 this large museum has become a favourite amongst adults and children alike with its many “hands-on” interactive exhibits and entertaining and educational demonstrations. The museum is located next to the Museum of History in Tsim Sha Tsui and has a permanent exhibition area of 6,500 sq m with over 500 exhibits. The exhibition halls span four floors all of which encircle a huge 22 metre high Energy Machine, the largest of its kind in the world. The Ground Floor Exhibition Hall has exhibits demonstrating mathematics, motion, light, sound, life sciences and has a world of mirrors where visitors can see distorted images of themselves. The Jockey Club Environmental Conservation Gallery on the ground floor opened as a permanent exhibition in August 2010 and features over 40 interactive exhibits grouped under ten themes related to environmental protection including air, water, land resources, energy and waste. The exhibition also highlights the beauty of Hong Kong's natural ecology and provides advice on green living. The First Floor Exhibition Hall has Occupational Health and Safety, Electricity and Magnetism Gallery and Science News Corner. 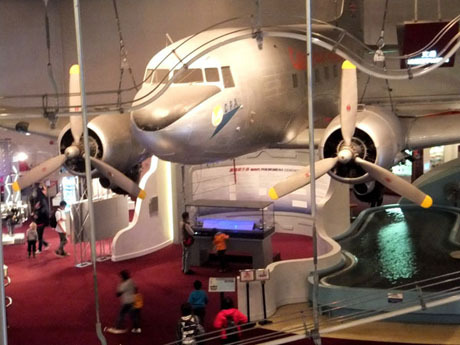 The Second Floor Exhibition Hall has a prototype zone and exhibits on telecommunications, food science, home technology, and transportation featuring Hong Kong’s first airliner, a Cathay Pacific DC-3 suspended from the ceiling, and a flight simulator. The Third Floor Exhibition Gallery has an Energy Efficiency Centre and Children's Gallery with many entertaining and educational interactive activities. 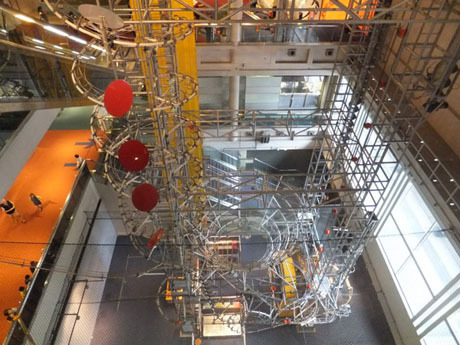 The 22-metre high Energy Machine demonstrates the relationship between energy conversion and the movement of balls in an entertaining manner when synthetic fibre balls are set in motion zig-zagging along some 1.6km of tracks along two towers and a connecting gallery activating dramatic sounds from bells and gongs and visual effects along their journey. The Energy Machine operates at 11am, 1pm, 3pm and 5pm on Mondays, Tuesdays, Wednesdays and Fridays and additionally at 7pm on Saturdays, Sundays and public holidays. There is a daily series of demonstrations by enthusiastic staff who manage to make topics such as “Liquid Nitrogen”, “Artificial Clouds” and "Electricity and Magnetism" entertaining and special exhibitions are held throughout the year. The museum also has a Resource Centre, Lecture Hall, classroom, laboratory, book shop and gift shop. The annual attendance of the museum in the fiscal year ended 31st March 2017 was 1,237,000. 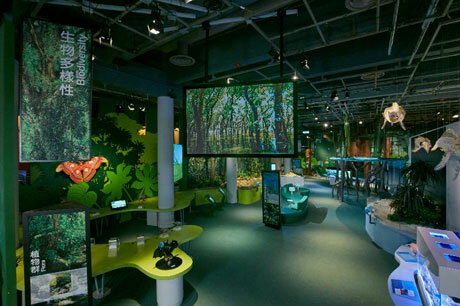 The Biodiversity Gallery, opened in September 2016, recreates diverse natural environments and habitats from around the planet, allowing visitors to enjoy an immersive experience. Visitors are able to explore nature in a visual, tactile and thought-provoking manner through interactive exhibits, dioramas and specimen displays based on four distinctive themes, namely "Local Biodiversity", "Variety in the World", "Changes through Time" and "Nature Lab". "Local Biodiversity", the first exhibition area in the gallery, introduces the nature of Hong Kong in the aspects of sea, land and sky. Visitors can find information on endemic species of plants and animals, as well as wildlife habitats such as woodlands and sandy beaches in Hong Kong. "Variety in the World" presents a huge variety of the world's life forms and describes to visitors flora and fauna around the world, the adaptation of animals and the global problem of the extinction of species. "Changes through Time" offers a series of enlightening exhibits, including a 12-metre-long graphic on a wall, which shows the genesis of life from simple cells to the appearance of complex life forms such as Homo sapiens. It visualises the connection between the history of the Earth and life sciences. "Nature Lab", located at the centre of the gallery, gives visitors opportunities to become scientists. By using microscopes and other equipment to observe living and non-living specimens, visitors can experience the fun of doing scientific research. In April 2017 the museum opened a Children's Gallery. The new gallery's 10 major exhibits were made by Universcience in France. They were carefully developed with advice from educators and other professionals and in collaboration with various artists, who helped to enhance the aesthetic appeal and educational value of the exhibits. They are designed for two groups of children - those aged 2 to 7 and those aged 5 to 12 - based on their physical, intellectual and emotional development. 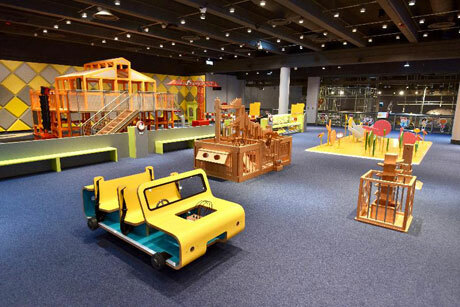 Highlight exhibits include "Big Kids' Worksite", "Time Tower" and "Hidden Animals". The exhibits encourage children not only to use their imagination, but also to co-operate and accomplish missions together. OPENING HOURS – 10am to 7pm Monday to Wednesday and Friday. 10am to 9pm Saturday, Sunday and public holidays. Closed on Thursdays (except public holidays) and the first two days of Chinese New Year. Closes at 5pm on Christmas Eve and Chinese New Year’s Eve. ADMISSION – HK$20 (HK$10 for seniors 60 and over). Children under 4 and full time Hong Kong students free. Free admission for all on Wednesdays. Box Office closes one hour before museum closing time. GETTING THERE - MTR to Tsim Sha Tsui exit B2 then walk along Cameron Road to Chatham Road South. There is an elevated pedestrian footbridge link to the museum (about 15 mins). MTR to East Tsim Sha Tsui exit P2 then follow Chatham Road South (about 10 minutes). MTR to Hung Hom exit D1 and follow elevated covered pedestrian link under Cheong Wan Road to Science Museum Road, Granville Road and Chatham Road South (about 15 mins). Buses 5, 5C, 8, 8A, 26, 35A, 41A, 81C, 87D, 98D, 110, 203, 208, 13X, 215X, 219X, 224X, 260B, 260X and A12 pass the museum. East Tsim Sha Tsui Bus Terminus on Science Museum Road is five minutes walk from the museum and served by buses 26, 35A, 41A, 98D, 208, 13X and 973. Also all Cross-Harbour buses stop at toll plaza at Hung Hom. NOTE – The Science Museum is located next to the Museum of History although the two museums have postal addresses in different streets. * HONG KONG MUSEUM OF ART CLOSED ON 2nd AUGUST 2015 FOR MAJOR RENOVATION WORK AND UPGRADE OF FACILITIES AND IS EXPECTED TO REOPEN IN NOVEMBER 2019. 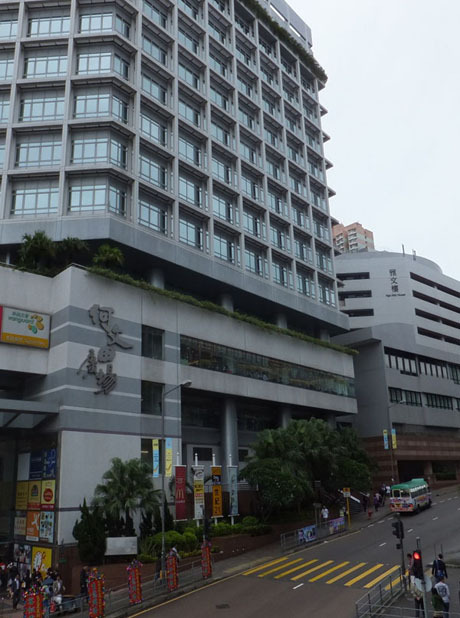 The Museum of Art was formerly known as the City Museum and Art Gallery and moved from its previous location in City Hall across the harbour to its present large 17,530 sq m five-storey building in Tsim Sha Tsui in 1991. The museum aims to preserve the cultural heritage of China and promote art with a local focus. 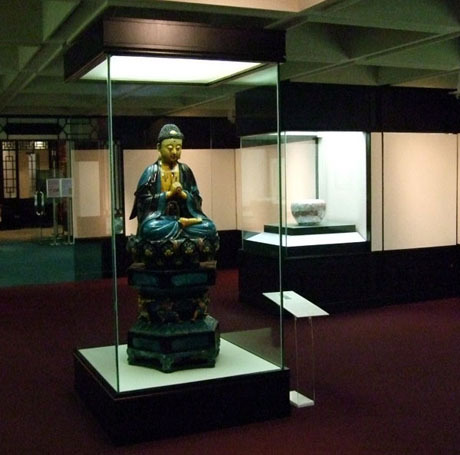 The museum’s collection comprises over 15,000 items divided into five major categories: Chinese Antiquities, Chinese Painting and Calligraphy, Contemporary Hong Kong Art, Historical Pictures and the Xubaizhai Collection of Chinese Painting and Calligraphy and these are displayed in five galleries. Amongst the exhibits are Chinese ceramic gems, calligraphy works, fine art and sculptures. There are a further two Special Exhibition Galleries which regularly feature prestigious local and international exhibitions on various themes. The museum also has a branch museum, Flagstaff House Museum of Tea Ware. Free public guided tours are available daily (except Mondays) in English (11am), Cantonese (3pm and 5pm) and Putonghua (4pm) and themed tours of specific galleries in English and Cantonese are offered on Wednesday, Saturday and Sunday afternoons (refer to the museum’s website for timetable). Digital audio guides to the Gallery’s collections in English, Cantonese and Putonghua can also be hired for a nominal fee. Other facilities at the museum include Lecture Hall, Workshops, Ceramics, Painting and Print Studios, Café and Bookshop. On the first Sunday of each month there is a free concert performance in the Lobby of the museum from 3-30pm to 4-30pm. The concert series is entitled "The Sound of Art" and is performed by various guest musicians. 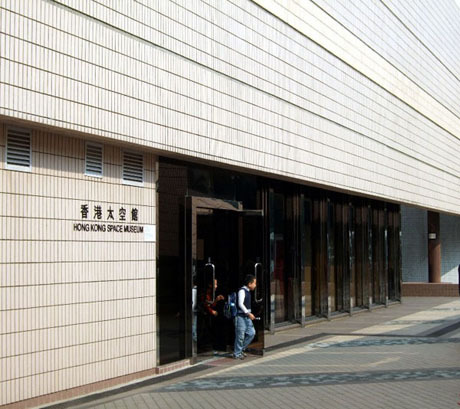 A major renovation of the museum, estimated at HK$889 million renovation of the museum will see the museum close for up to three years from mid-2015. The museum, which is considered as "hidden" behind the Space Museum and clad with the same tiles as the adjacent Cultural Centre, will have a redesigned exterior to make it more visible and a new wing. There will be an additional 2000 square-metres of exhibition space. The lobby, restaurant and souvenir shop will be moved to the ground floor and a more prominent entrance added. 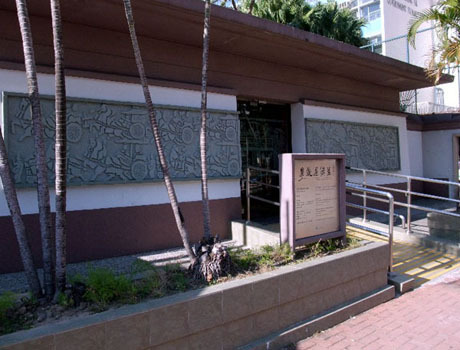 During the renovation most items will be placed in storage but a series of exhibitions will be held at Hong Kong Heritage Discovery Centre in Kowloon Park which has been requisitioned by the Museum of Art during its closure. City Hall, the museum's original home from 1962-1991 and Central Library will also provide temporary facilities for the museum. 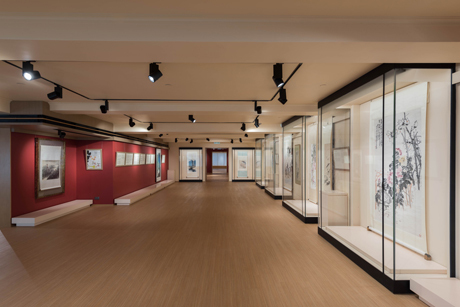 Since 1995 the museum has received donations of 370 pieces of work from family of the late Wu Guanzhong, one of China's greatest modern artists who died in 2010. These include oil paintings, ink paintings, gouache paintings, watercolours, sketches, acrylic and porcelain paintings. The museum now has over 450 pieces of Wu's work and when the museum reopens in 2019 following renovation it will have a dedicated "Wu Guangzhong Art Gallery". The Museum of Art attracted an annual attendance of 414,000 visitors in the fiscal year ended 31st March 2015 and 118,000 visitors from 1st April 2015 until its closure for renovation in early August 2015. OPENING HOURS – 10am to 6pm Monday to Wednesday and Friday. 10am to 7pm Saturdays, Sundays and public holidays. Closes at 5pm on Christmas Eve and Chinese New Year’s Eve. Closed on Thursdays (except public holidays) and the first two days of Chinese New Year. ADMISSION – previous admission charge discontinued. Admission will be free to all when the museum reopens in 2019. This museum with its domed planetarium roof has been a distinctive landmark on the Tsim Sha Tsui harbour side since 1980. 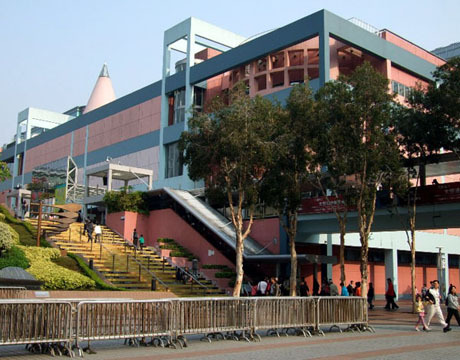 Located next to the Hong Kong Museum of Art and Hong Kong Cultural Centre the 8,000 sq m museum provides a world-class facility for research and education into astronomy and space science and includes exhibition halls, planetarium, space theatre, research centre and lecture rooms. 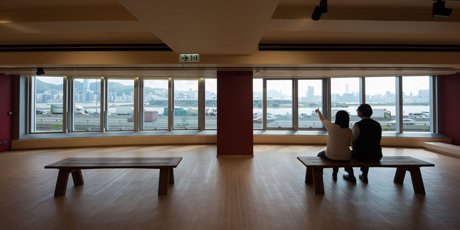 Following a major HK$32 million renovation programme which commenced in November 2015 the museum's exhibition halls reopened in April 2018. The Hall of the Cosmos and the Hall of Space Exploration are located on the ground floor and first floor of the museum. Covering a total area of 1,600 square metres, the two exhibition halls showcase about 100 new exhibits, of which about 70 per cent are of interactive design. With the aid of advanced equipment coupled with lighting effects and environmental decorations, the exhibition halls aim to take audiences on a journey of discovery allied to extra sensory perception. THE HALL OF COSMOS explores the evolution of the universe, from the solar system where Earth is located to the myriad stars, Milky Way and distant galaxies. Among fun-filled interactive exhibits, "Aurora" allows visitors to adjust the strength of "solar wind" inside a vacuum tube to create a mini-aurora, while "Icy Bodies" creates comets with dry ice to simulate their jet streams and movement. In "Gravity Surfing", visitors can stand on surf boards for a simulated adventure through different celestial objects to help them better understand the warping of space by gravity. 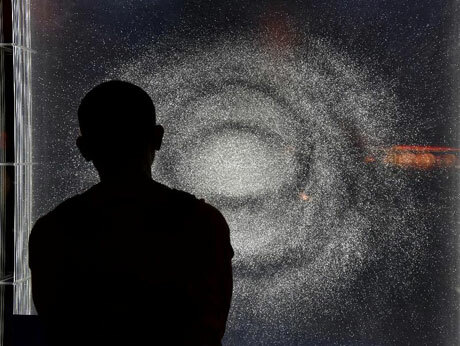 The exhibit "The Milky Way"
In THE HALL OF SPACE EXPLORATION, which depicts the development of space exploration and space technology, visitors are able to enter an upside-down virtual space station to experience the disoriented sensation of being in a weightless environment. Visitors can also try a simulated launch of a Long March 2F rocket from the Jiuquan Satellite Launch Center. A 3D photo effect is also provided for visitors to experience how it feels to be inside a re-entry capsule. 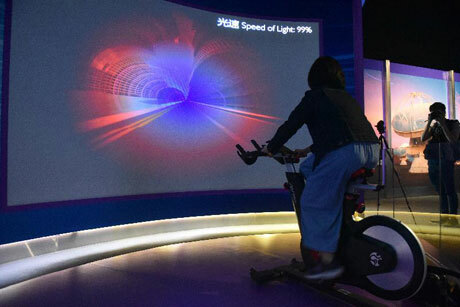 The interactive exhibit "Relativity Bicycle"
A seven-month HK$34 million renovation of the Stanley Ho Space Theatre completed in June 2009 gave the theatre a completely new look with a new digital planetarium projection system with a resolution of over 53 million pixels making it one of only two theatres in the world capable of projecting such high definition images. The system projects both full-dome animations or movies and the new seats are installed with a multi-language narration system and interactive features enabling visitors to participate in real-time games. In early 2012 the digital projection system in the Stanley Ho Space Theatre was upgraded at a cost of HK$7 million with the new system consisting of eight ultra-high resolution projectors and 32 high-performance computers, enabling projection of stereoscopic images with a resolution of up to 16 million pixels. "Norman the Snowman - On a Night of Shooting Stars", runs from 1st November 2018 to 29th April 2019. 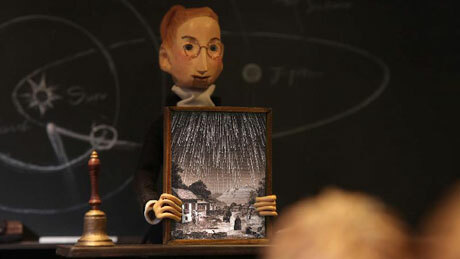 Using stop motion animation and adorable puppets, the show takes audiences on a virtual journey to the stars under the dome of the Space Museum. In the small hours of November 13, 1833, a huge number of shooting stars, also known as meteors, were witnessed in North America. As many as 20 shooting stars per second were said to have appeared, to the astonishment of the people who saw them, and it is still regarded today as the largest meteor shower in modern history. Unfortunately, photography had not been formally invented back then so the accuracy of the records of that meteor shower cannot be assured. In the show, a boy who is fascinated by meteors longs to see a meteor shower, and his friend Norman the snowman tells him one will occur the following night. However, it has been snowing in town and the chance of seeing meteors is slim. Leaving the thick cloud cover and the ridicule of others behind, the boy decides to go on a quest with his snowman friend Norman in search of somewhere with clear skies. But who and what will they run into on the way? The 32-minute show, of which the first five minutes is an introduction to the Chinese skies, is screened at the museum's Stanley Ho Space Theatre. It will be screened daily at 3-50pm and 7-20pm. An additional show at 12-20pm will be available on Saturdays, Sundays and public holidays. 3D dome show, "THE STORY OF EARTH 3D" runs from 1st January 2019 to 30th June 2019. Using stunning and complex visualisations based on the latest scientific modelling, the film takes the audience back in time to the origins of our planet to explore an extraordinary chain of events. How did our planet Earth form and evolve? In "The Story of Earth 3D", the audience will find out how the planet was born from star explosions and sculpted by violent collisions in space, and understand the origins of Earth and how it made life not only possible but sustainable. 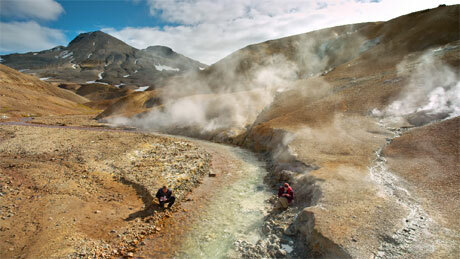 A team of geologists travels around the globe in the film to show the audience clues that help piece together the story of Earth. The 40-minute show is screened at the museum's Stanley Ho Space Theatre daily at 2-40pm and 6-10pm. An additional show at 11-10am is available on Sundays and public holidays. Tickets priced at HK$24 (front stalls) and HK$32 (stalls) are available at the Hong Kong Space Museum Box Office and URBTIX. Presenting new ocean science and technology, the film shows the audience the largest and least explored habitat on Earth, letting viewers discover the untold stories of the oceans' most fascinating creatures from the coastal shallows to the mysterious depths. Oceans cover more than 70 per cent of the Earth's surface, yet people have better maps of the surface of the moon and Mars than they do of the ocean floor. In "Oceans: Our Blue Planet", the audience will be led by lively dolphins, view coral reefs and meet the ingenious tuskfish that uses a tool to open its food. 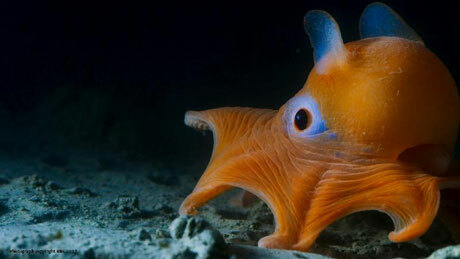 In the great forests of the sea, there is a cunning octopus shielding herself in an armour of shells to hide from predators. The 40-minute show is screened daily (except Tuesdays other than Tuesdays which fall on a public holiday) at 1-30pm, 5pm and 8-30pm at the Stanley Ho Space Theatre from 1st March 2019 to 31st August 2019. Tickets priced at HK$24 (front stalls) and HK$32 (stalls) are available at the Hong Kong Space Museum Box Office and URBTIX. In November 2008 the Space Museum opened an iObservatory in a three-storey building at Lady MacLehose Holiday Village in Sai Kung Country Park with a six-metre "onion" dome and 60cm Cassegrain Telescope enabling observers to view celestial objects 4,000 times dimmer than those visible to the naked eye. The museum opened an Astropark at Chong Hing Water Sports Centre at High Island Reservoir also in Sai Kung Country Park in January 2010. 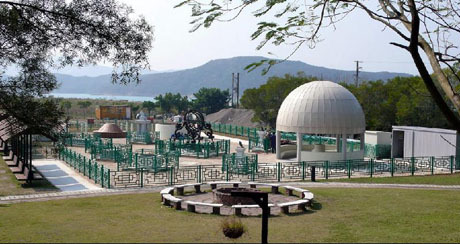 The Astropark, which is effectively a theme park with stargazing facilities, is open 24 hours a day and is divided into three zones, an Educational Zone for day-time use, Naked-eye observation area for casual users and Telescopic Observation Area for amateur astronomers. The museum's annual attendance in the fiscal year ended 31st March 2015 was 480,000 to its exhibition halls and 349,000 to its Space Theatre. From 1st April 2015 until early October 2015 before closure for renovation the exhibition halls received 287,000 visitors. The Space Theatre received 247,000 visitors in the fiscal year ended 31st March 2016 and 284,000 visitors in the fiscal year ended 31st March 2017. OPENING HOURS – Monday, Wednesday, Thursday and Friday 1pm to 9pm, Saturday, Sunday and public holidays 10am to 9pm. Closes at 5pm on Christmas Eve and Chinese New Year’s Eve. Closed on Tuesdays (except public holidays) and the first two days of Chinese New Year. Admission to the exhibition halls is by two-hourly sessions with quotas. See website for details. ADMISSION – Exhibition Halls* HK$10 (Seniors 60 and over HK$5, children under 4 and full time Hong Kong students free). Omnimax Show/3D dome show HK$24 front stalls, HK$32 stalls (half-price for seniors 60 and over, children under 3 not admitted). Free admission to Exhibition Halls only on Wednesdays. Discovered in 1955 during construction works the Han dynasty (AD25-220) tomb was excavated and preserved in its original site on a wave-cut terrace in the Lei Cheng Uk area of what was once the north western coast of the Kowloon Peninsula. 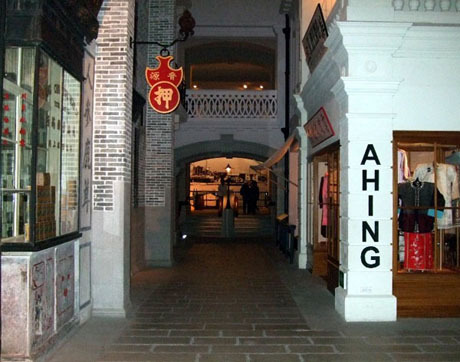 The tomb and exhibition gallery were opened to the public in 1957 and this small museum is now a branch museum of Hong Kong Museum of History. 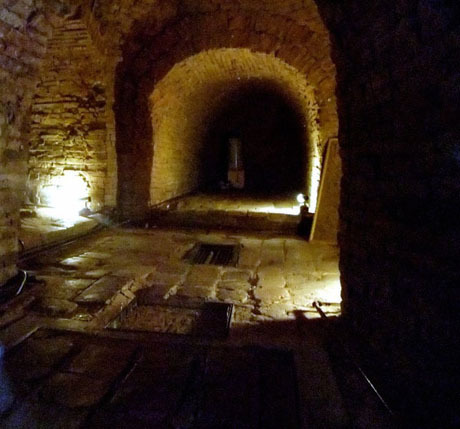 The tomb is a cross-shaped brick structure with four chambers and domed roof and although some fifty-eight pottery and bronze objects were found no human skeletal remains were found. Some of the tomb bricks have inscriptions and patterns which has helped dating of the tomb. The entrance to the front chamber was damaged during excavation and it is not known how the tomb was sealed. 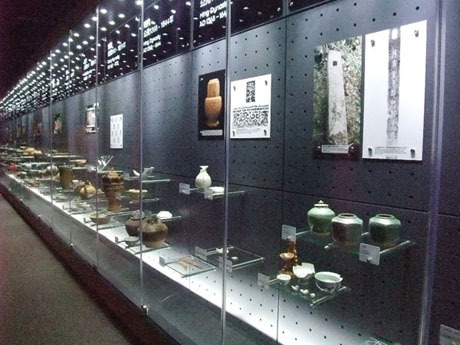 The museum comprises a small gallery where objects including pottery cups, bowls, models, pots and cauldrons and bronze bells and mirror found in the tomb are displayed. The tomb itself is at the rear of the exhibition gallery and although visitors are not allowed to enter the tomb the front and rear chambers can be viewed through a transparent screen. There is a small secluded park behind the tomb. During the fiscal year to 31st March 2017 the museum attracted 39,000 visitors. OPENING HOURS - Sunday to Wednesday, Friday and Saturday 10am to 6pm. Closes at 5pm on Christmas Eve and Chinese New Year’s Eve. Closed on Thursdays (except public holidays) and the first three days of Chinese New Year. GETTING THERE – MTR to Cheung Sha Wan exit A3 then 5 minutes walk along Tonkin Street. Buses 2, 2A,112,118,702,970 and 970X pass the museum on Tonkin Street. Hong Kong Heritage Discovery Centre opened in 2005 in a splendidly preserved former colonial British Army barracks in Kowloon Park which had previously been home to Hong Kong Museum of History before its move to its current location on Chatham Road South. The centre which falls under the auspices of the Antiquities and Monuments Office aims to inform the public of its work in preserving the archaeological and cultural heritage of Hong Kong. The centre has a permanent exhibition gallery on the first floor displaying, pottery, glassware, ceramics and other artefacts and on the ground floor is a thematic gallery for temporary exhibitions. There is a reference library which is open to the public for research and educational purposes, lecture hall and educational activity room. This is a good place for visitors to go to obtain information, leaflets and guides on heritage trails, antiquities and monuments in Hong Kong. The Discovery Centre attracted 203,000 visitors in the fiscal year to 31st March 2017. GETTING THERE – The centre is located near the Bird Lake in Kowloon Park. MTR Tsim Sha Tsui exit A1 is about five minutes walk to the centre from the Kowloon Mosque entrance to the park. Numerous bus routes travelling along Nathan Road stop close to the park entrances including 1,1A,2,6,6A,7,9,13X, 35A,41A,63X,234X,A21. 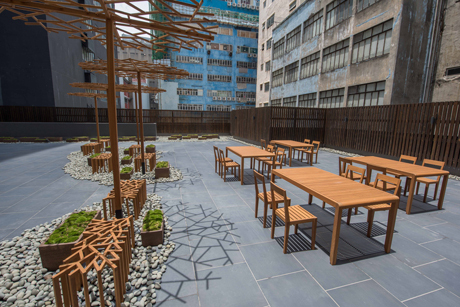 Hong Kong Housing Authority has established a 1000sq-metre Exhibition Centre at its Headquarters at Ho Man Tin which illustrates the development of public housing in Hong Kong. The exhibition features glazed display panels, building models, mock-up flats and various collections of photos and videos. 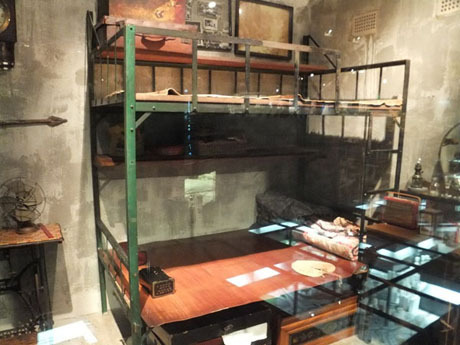 Through these exhibits, visitors are able to glimpse social changes which have occurred over the decades from the 1950’s and appreciate the improvements in living standards in public housing estates. Visitors can walk over a glass observation bridge, below which is a huge model showing the magnitude and distribution of housing estates throughout the territory. Visitors can also freely browse the various collections of photos and videos and participate in an interactive game to build the ideal housing estate. OPENING HOURS – Monday and Wednesday to Friday 9-30am to 6-30pm. Saturday 9am to 7pm. Closed on Tuesdays, Sundays and public holidays. ADMISSION – Free. Casual visitors welcome. Visitors need to sign in at reception on entry to the Housing Authority building and are given a visitor badge. Group visitors can make appointments for guided tours. GETTING THERE – Buses 109 Jointly-operated, KMB/NWFB (Hong Kong Macau Ferry Terminal to Ho Man Tin Estate), 8 KMB (Star Ferry Pier Tsim Sha Tsui to Kowloon MTR Station), 18 KMB (Nam Cheong MTR Station to Oi Man) and 7B KMB (Hung Hom Ferry Pier to Lok Fu) all stop on Sheung Foo Street outside Ho Man Tin Plaza, about 100-metres walk from Blocks 3 & 4 of the Housing Authority Headquarters. Buses 17 KMB (Oi Man Estate to Kwun Tong) , 41 KMB (Cheung Ching to Kowloon City Ferry Pier) and 45 KMB (Lai Yiu to Kowloon City Ferry Pier) stop on Fat Kwong Street outside Blocks 3 & 4 of the Housing Authority Headquarters. Sun Museum is a non-profit, private museum established in May 2015 by the Simon Suen Foundation. The museum aims to promote Chinese arts and culture and enable an understanding of how the art world in Hong Kong is enlivened by a diversity of cultures and how the local community is enriched by a wealth of Chinese traditions. The office in charge of administration is considered the heart of the museum and is therefore positioned in the centre. According to the five-elements concept, the office represents earth and the walls should therefore be in yellow. 11D (from Lok Fu), 23 (from Shun Lee), 74C & 74D (from Kau Lung Hang), 74X (from Tai Po Central), 80 (from Mei Lam Bus Terminus), 80P (from Hin Keng Bus Terminus), 83X (from Wong Nai Tau Bus Terminus), 93A (from Po Lam), 268C (from Long Ping Station) and 269C (from Tin Shui Wai Town Centre). FERRY - from Hong Kong Island scheduled ferry services operate from North Point Ferry Pier to Kwun Tong Ferry Pier and from Sai Wan Ho Ferry Pier to Kwun Tong Public Pier.